Anti- is delighted to announce the signing of GALACTIC, the New Orleans-based frontrunners of futuristic funk. Currently putting the finishing touches on their upcoming disc, From The Corner To The Block, which was co-produced by the band's saxophonist Ben Ellman, the new recording from the five-piece - due August 21 - is set to include guest appearances from an array of today's most innovative MC's, including The Coup's Boots Riley, Lyrics Born, Digable Planets' Ladybug Mecca, Juvenile and Jurassic 5's Chali 2na. In advance of the disc's release, GALACTIC - which features bassist Robert Mercurio, guitarist Jeff Raines, keyboardist Richard Vogel, drummer Stanton Moore and Ellman - will celebrate the project when they perform at next month's four-day Bonnaroo festival, held in Manchester, Tennessee from June 14th - 17th. Participants in four of the first five Bonnaroo events, the group known for incorporating elements of funk, rock, hip-hop and electronica into its own modern variation of the genre will be joined by the aforementioned Boots Riley, Lyrics Born and Chali 2na and Mr. Lif, as well as other project accomplices like Gift of Gab of Blackalicious and Lateef the Truthspeaker. The MC's that contributed to From The Corner To The Block were asked to approach their lyrics with one uniform concept: Corners. Stemming from the idea that GALACTIC's hometown is full of evocative street names inspired by history, mythology and multiple ethnicities, guest artists were asked to think of an intersection that was important to them. Just as every corner is an intersection of two paths - for instance New Orleans' own “Law and Desire” or “Martin Luther King and Oretha Castle Haley” - the disc is a meeting of two different styles of music. 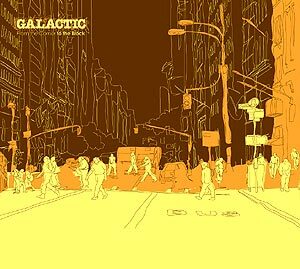 GALACTIC has played with hip-hop giants like The Roots, Talib Kweli, and Jurassic 5, and such collaborations seeded the uplifting, thought-stirring and undisputedly natural merger of the band's electrified funk and hip-hop's insightful lyricism on From The Corner To The Block. On this record more than any other, GALACTIC marries the two types of New Orleans street music. Old school Brass Band second line grooves meet bounce style inspired hip-hop on the title track for which GALACTIC enlisted native superstar Juvenile - with whom the band performed on Jimmy Kimmel Live - and the up and coming Soul Rebels Brass Band. On the track “Second & Dryadres” the band called on Mardi Gras Indian Big Chief Monk Boudreaux whose chants blend seamlessly with the bands electro funk sound thanks to Ben Ellman's innovative production. Born in the early '90s, after Washington DC punks Raines and Mercurio relocated to New Orleans and found themselves intoxicated by a scene that nurtured The Meters, Professor Longhair, the Neville Brothers and Dr. John, the five-piece future funk outfit was born. Having spent over a decade conquering venues worldwide while building a rabid fanbase, GALACTIC junkies are drawn by the group's merger of modern and retrospective styles. With six albums and countless landmark live shows to its credit, the instrumental powerhouse is once again headed to new territory on its new disc. While the band has always embraced stylistic changes and relished its musical adventures, its instrumental chops have never wavered. Following up 2003's Dan “The Automator” Nakamura (Dr. Octagon, Handsome Boy Modeling School, Gorillaz) produced Ruckus - its last before the departure of vocalist Theryl DeClouet -- From The Corner To The Block finds the ever evolving quintet continuing to test the waters of what funk can be. GALACTIC's forthcoming set finds the forward thinking band also working with the likes of DJ Z-Trip, Lifesavas, Vursatyl New Orleans phenom Trombone Shorty and up an coming Ubituity artist Ohemga Watts, Nino Moschella. for any interested, we have some really fresh Galactic screen printed posters.